Apple CEO Tim Cook and Google CEO Sundar Pichai attended the World Internet Conference in China. 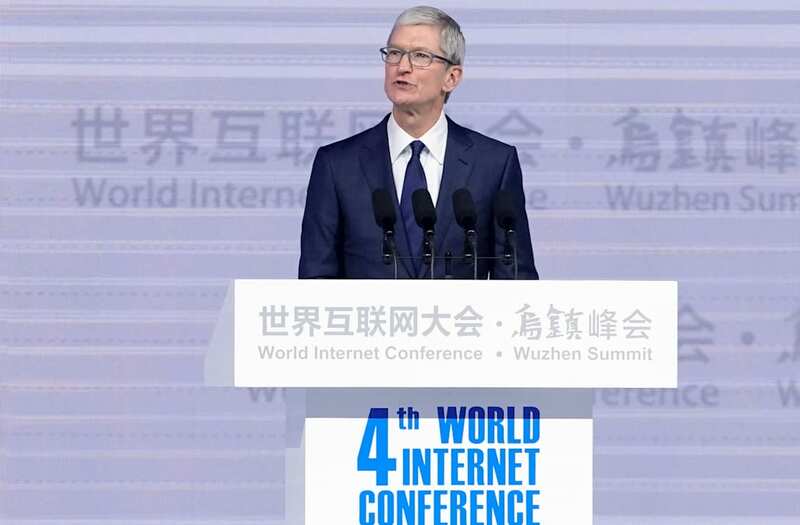 Apple CEO Tim Cook and Google CEO Sundar Pichai both appeared at China's World Internet Conference, a gathering the Chinese government reportedly uses to promote its strategy of tightly controlling what's available online in the country. Cook gave a keynote address on Sunday. “The theme of this conference — developing a digital economy for openness and shared benefits — is a vision we at Apple share,” Cook said, according to Bloomberg. “We are proud to have worked alongside many of our partners in China to help build a community that will join a common future in cyberspace." Pichai didn't give a speech, but he did appear on a panel with Xiaomi founder Lei Jun. "Technology is giving opportunities at a global scale, driving interconnectedness and cooperation and I think it’s a big trend and I think it’s almost irreversible at this point," Pichai said. Although the two star CEOs reportedly did not make remarks that touched directly on contentious policy issues, such as Apple's decision to pull VPN apps from its App Store under Chinese government pressure, or the fact that Google does not operate its services in mainland China, their appearance at the fourth annual conference lends legitimacy to the controversial event. At the conference, a top communist party official called for tight control of the internet while Cook was in the audience, according to The New York Times. One opinion written after Cook's speech said that he "kissed the ring." Apple registered $9.8 billion in sales in China for the most recent quarter that figures are available, just under 20% of Apple's overall revenue. The sensitivity of the World Internet Conference is illustrated by a question posed to Apple and Cook by senators Ted Cruz and Patrick Leahy earlier this year. "Since 2014, the Chinese government has held a World Internet Conference. Charles Smith, the co-founder of the non-profit censorship monitoring website GreatFire, described foreign guests of the Conference as 'complicit actors in the Chinese censorship regime and are lending legitimacy to Lu Wei, the Cyberspace Administration of China and their heavy-handed approach to Internet governance. They are, in effect, helping to put all Chinese who stand for their constitutional right to free speech behind bars.' What role, if any, has Apple or its employees had with respect to the World Internet Conference in China? Does Apple support the conference?" "Apple is not a financial sponsor of the conference. Apple has participated in the World Internet Conference in the past, and Apple employees, including our CEO, will participate in the future. We are convinced that continued engagement is the surest way to effect change. We believe in the free flow of information everywhere, and we remain committed to this ongoing effort in all countries in which we operate, across a complicated world." Less than three weeks later, Cook would be the surprise keynote speaker at the World Internet Conference's opening ceremony.